We’re delighted to announce that we will be celebrating the grand reopening of our newly refurbished showroom on Saturday 22nd August. Starting from 10am, we will be offering a range of refreshments, giveaways and special offers. 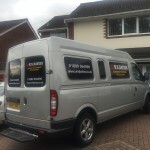 We recently added the new logo to the W N Davies van. Keep an eye out for it and if you see us driving round in it, don’t forget to give us a wave.